- Bernard, considering that Braga feature many Brazilians, can we compare the team with Shakhtar playing style wise? - Even with the large number of Brazilians taken into account, I don’t think the teams are very similar. Now we are trying to learn Braga’s game principles with the help of the video shown by Mister. In some ways we are really similar, but in other aspects we are totally different. In general, Braga are strong, we are facing two tough games. - For the first time in the current Europa League season, Shakhtar will start the two-legged tie away. Will it affect the strategy in any way? - I do not think it is of great importance. We try to always give our all! We play our own style, regardless of the match venue. Now we are focusing on the importance of the upcoming meetings. - Braga has only once suffered a home defeat in the current Portuguese league season. Can we call them a team preferring to play at home? - Yes, without a doubt! We can see while analysing games that they excellently prove themselves at home in both the Portuguese League and Europa League. We will try to interrupt this winning streak of Braga and advance further. - In the domestic league, Braga concede one goal in each match on average. What does it mean in terms of the opponents’ defence? - They are strong defensively and counterattack wise. Although we know that just from videos. We will be able to try them in reality directly in the game. The most important thing is using our best qualities. 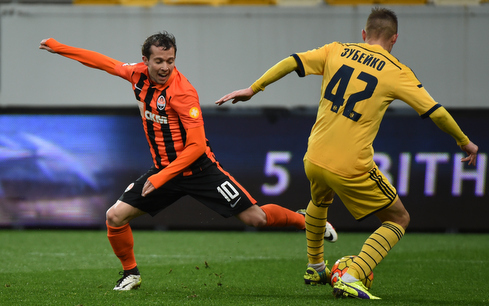 - Taking the two-legged tie into account, will Shakhtar be happy with a draw in Portugal? - We are always determined to win. Each meeting has its own history. You shouldn’t give your opponents a chance – you never know what to expect from them in the return leg. Yes, a draw is a pretty good result, but we will try to win. - Before leaving for Portugal, Shakhtar defeated Metalist. How will this game help you in preparation for Braga? - We took to the pitch for the match against Metalist being strong in spirit. We really needed the three points and we got them. Now the most important thing is achieving a positive result in the encounter with Braga.